Over winter break, I visited a part of the Yucatan Peninsula in Mexico. If you ever plan to go, I encourage you to get beyond Cancun, because there is just so much to see. My favorite part was visiting the Mayan ruins, and I barely scratched the surface, only getting to a few of the more famous ones. 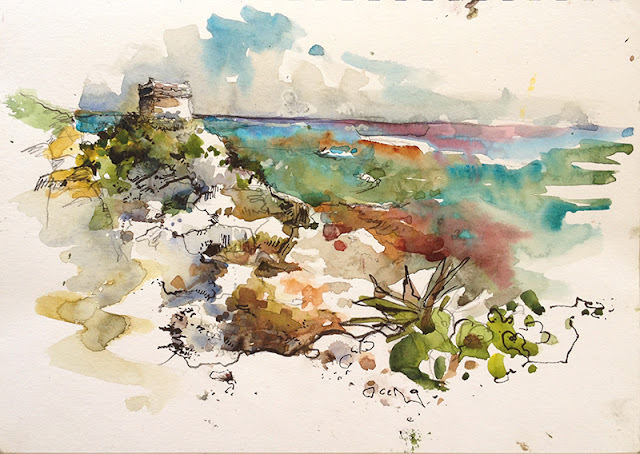 The setting of the ruins at Tulum is spectacular. The site is at the very edge of a cliff, the wind is strong and the ocean is an ever-changing array of jewel tones. I love painting like this, with the wind whipping my sketchbook. When I can feel the wind I can paint it… There goes my chance of ever being a studio painter! 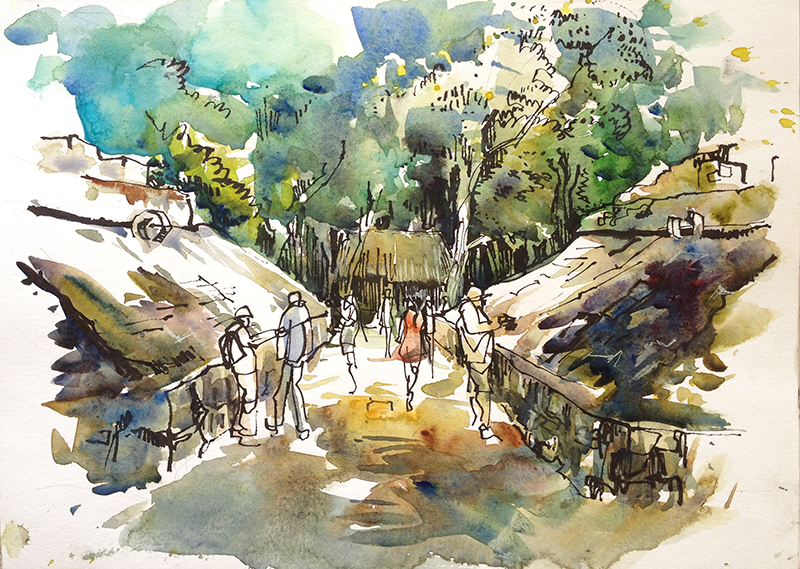 But my favorite setting was Coba where you walk through the jungle to get to different structures. Like the ballcourt, where a little-understood but much maligned game was played. Whatever the rules were, it must have been so hard to play with a large court and small stone 'hoops' set high on the sides. 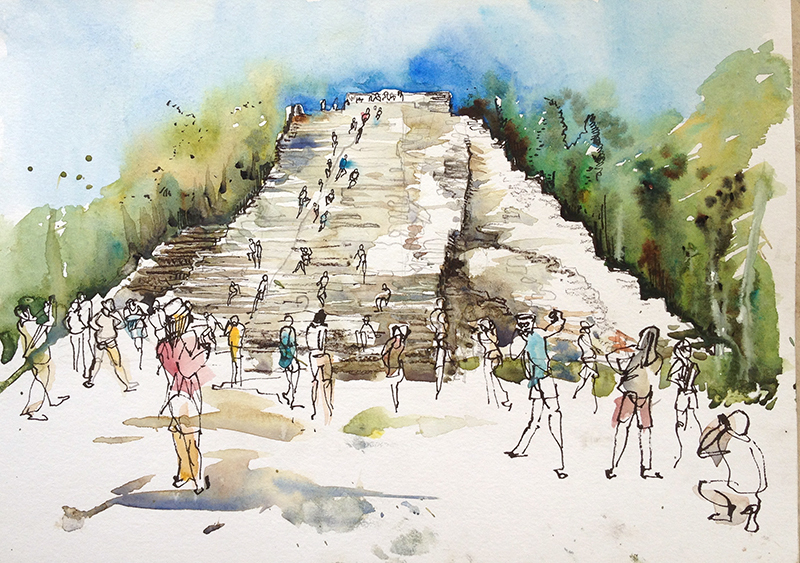 The pyramid structure at Coba is the tallest in the Yucatan and the view of the jungles from the top is breathtaking. And then, of course, there's Chichen Itza. The trouble with drawing such a well known site is that my sketch looks exactly like I expect it to... 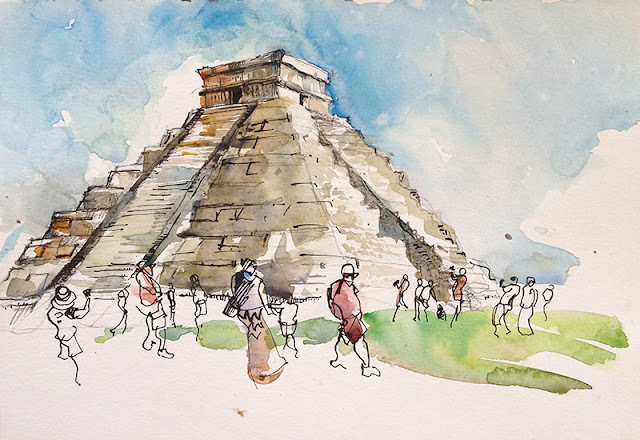 Still, I sketch it because this really well preserved pyramid really helps me see how it was built and wonder and be amazed by those who built it so long ago. 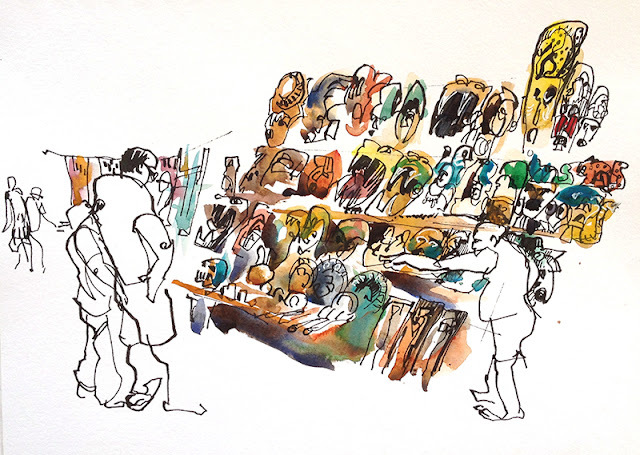 But I had so much more fun sketching the mask sellers. 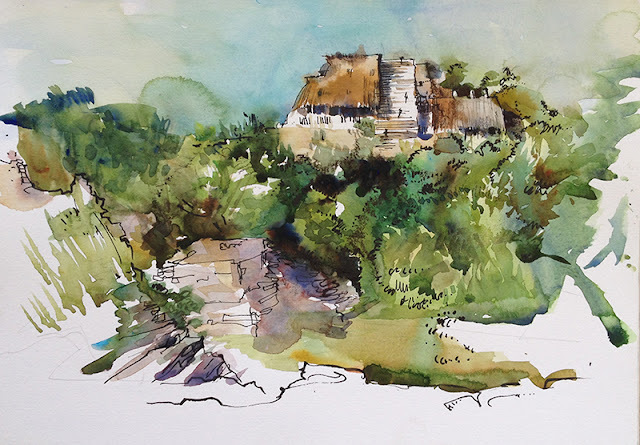 At Ek Balam , there were several tall structures so I sketched this from the top of one of them, looking over the treetops. It’s always hard to capture the scale of really big structures, and even harder when you draw them in the distance. The other thing that’s hard? Drawing a mass of trees in a tropical forest. They all vary so slightly in color and yet no two are the same green. And finally the littlest site I visited was El Rey, right off the hotel strip in Cancun. Oddly, it was the most deserted of all the ruins I went to, and I had most of the afternoon I spent there all to myself. 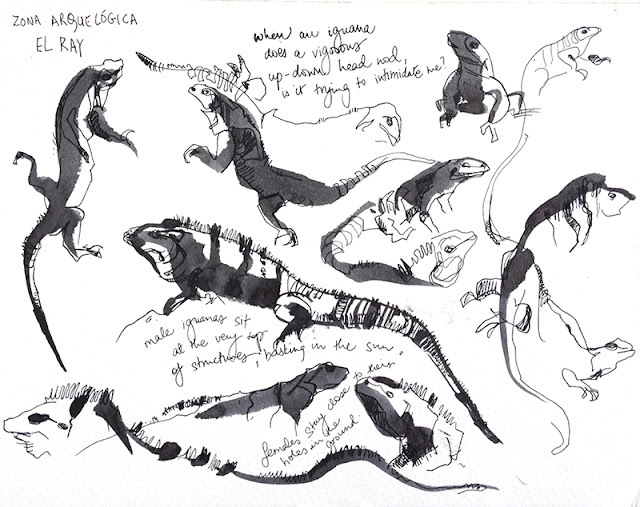 Well, there was me and the iguanas that rules the place. You can see lots more of my sketches from my trip here on my blog.